Probably you have a favorite in the world of flowers. 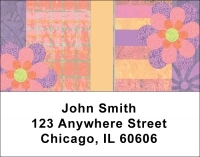 Likely, you'll find it in this collection of nearly 200 flower images to decorate your floral address labels. But it will be a tough job deciding among the roses, lilies, sunflowers, tulips, lilacs and other floral beauties. You can only weed out the runners-up and settle on the one that strikes your fancy. Besides stunning photos, there are many artful treatments by popular commercial artists such as Lena Liu, Lisa Bearnson and the duo of Challis and Roos. Classical or cartooned, poised in solitary glory or massed, scattered across the label or in company with butterflies, you can't miss with one of these spectacular labels.